Photo Story: Men's Basketball Faces UT Martin in CIT Game | Grand Central Magazine | Your Campus. Your Story. 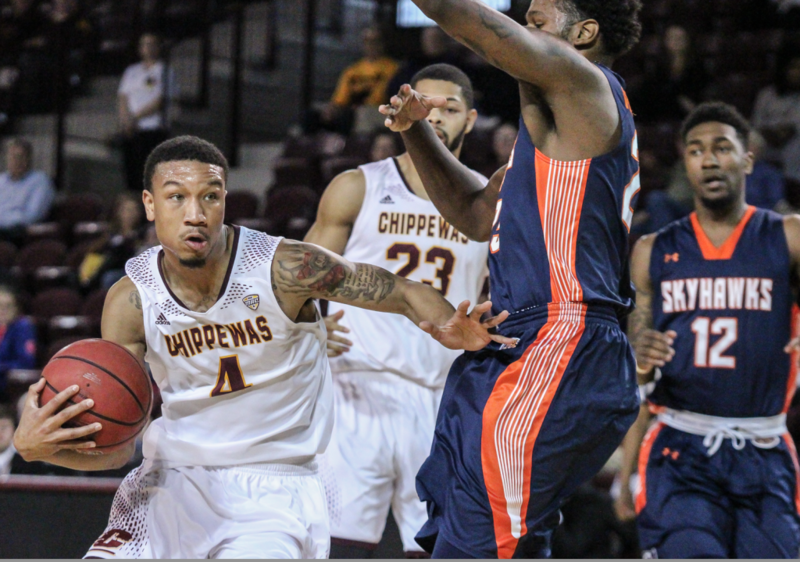 Central Michigan basketball hosted their first home, post-season game since 1970 against UT Martin on Wednesday, March 16. Earlier this week CMU earned a bid to the CollegeInsider.com Tournament. Forward Luke Meyer (24) shoots a hook shot in the first half against UT Martin at McGuirk Arena on Wednesday, March 16, 2016. 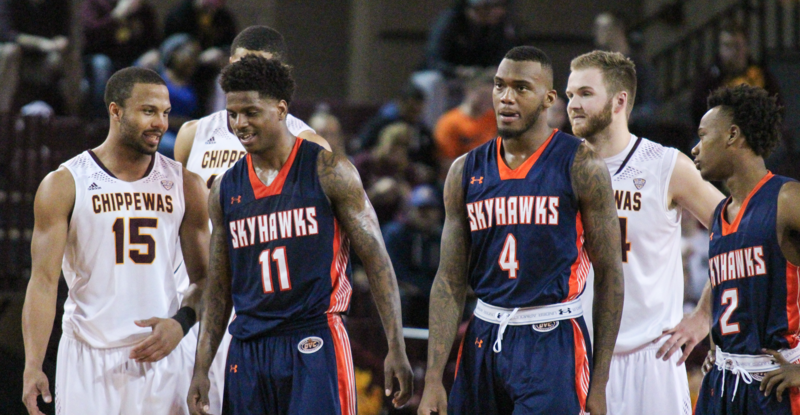 Guard Chris Fowler (15) talks at half court with UT Martin Guard Terrence Durham (11) during a technical foul free throw in the second half against UT Martin at McGuirk Arena on Wednesday, March 16, 2016. Unfortunately, CMU lost 76-73 after a back and forth game against the Skyhawks. UTM lead CMU by one point going into the second half. 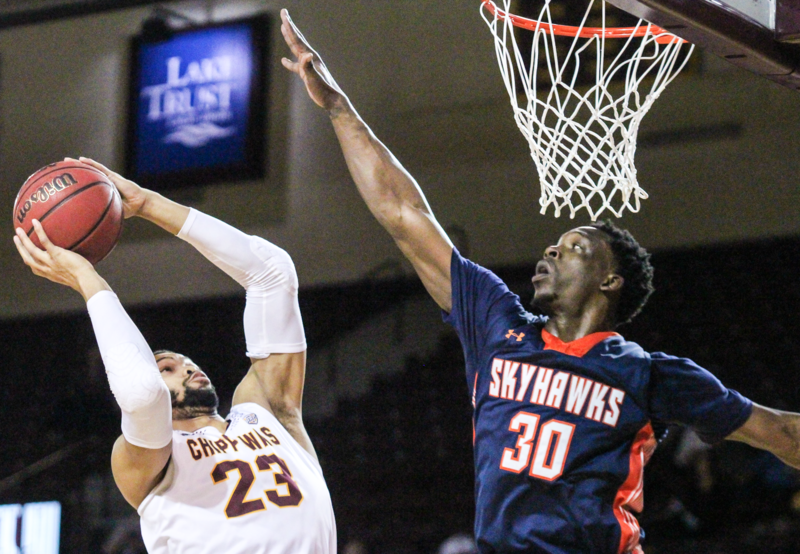 In the final seconds, UTM Guard Alex Anderson hit a three-pointer to put them up and over the Chippewas. From there CMU was forced to foul and couldn’t regain control of the game. Guard Rayshawn Simmons (4) drives the lane against UT Martin at McGuirk Arena on Wednesday, March 16, 2016. Guard Chris Fowler (15) swings the ball around the arch in the first half against UT Martin at McGuirk Arena on Wednesday, March 16, 2016. Forward DaRohn Scott (23) goes up for a layup in loss against UT Martin at McGuirk Arena on Wednesday, March 16, 2016. 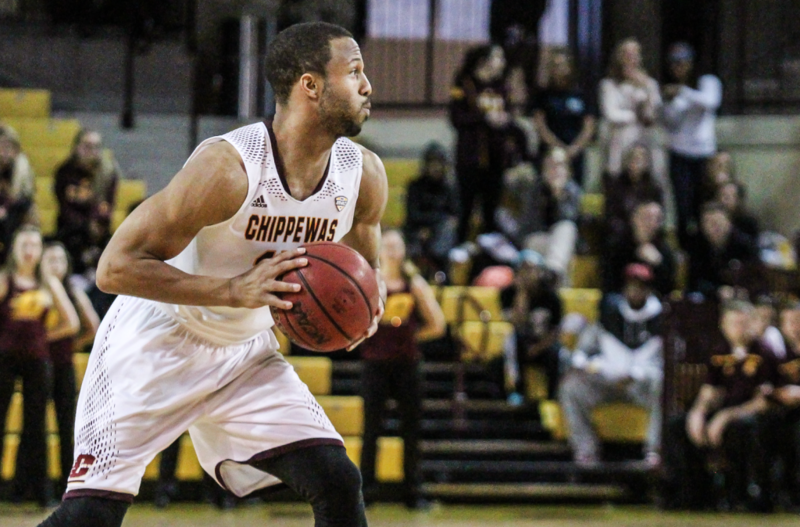 Guard Braylon Rayon was the Chippewas leading scorer with 24 points. He was just two rebounds away from recording a double-double. 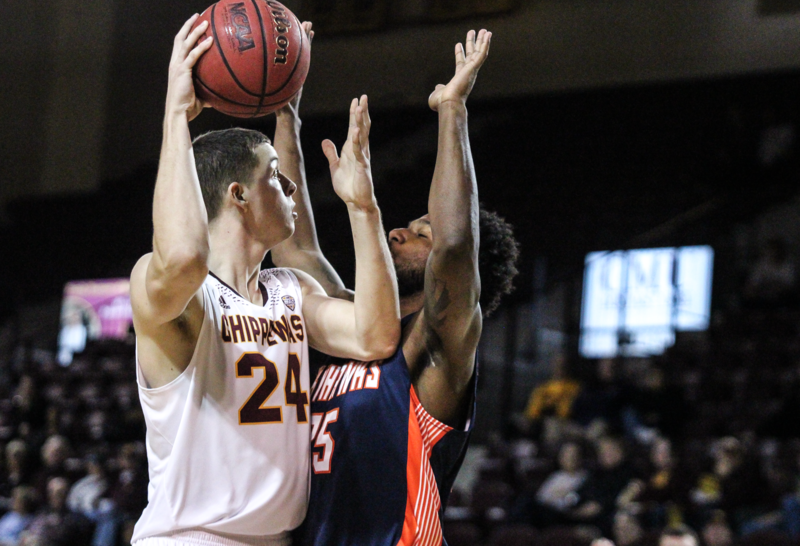 Josh Kozinski was also a huge help for the Chippewas off the bench with a couple key three-pointers that kept CMU in the game. He scored 15 points through out the night. 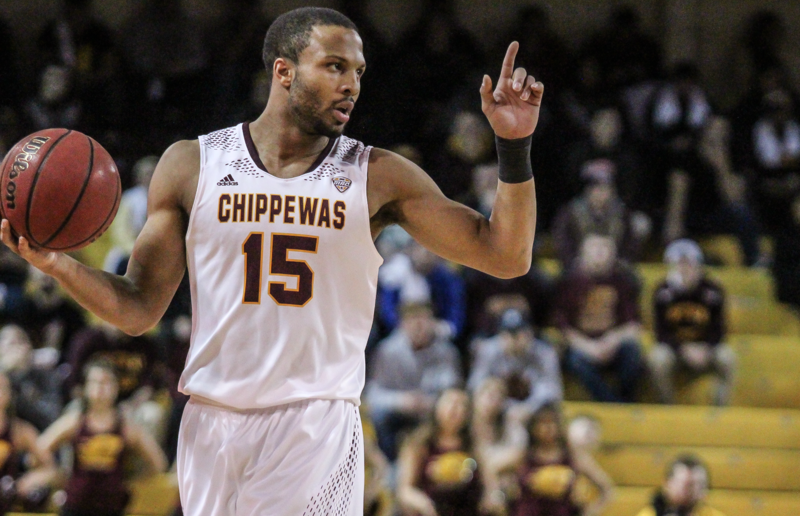 Tonight was also the last game for CMU seniors Chris Fowler, Rayshawn Simmons, Austin Stewart and John Simons. Each player supplemented the team in their own way; as it will take a lot to refill their shoes. Guard Chris Fowler (15) calls an offensive play in the 76-73 loss against UT Martin at McGuirk Arena on Wednesday, March 16, 2016. Photos and story by William Bly. Separator image Posted in Athletics, Food & Wellness and tagged with Basketball, cmu, William Bly.